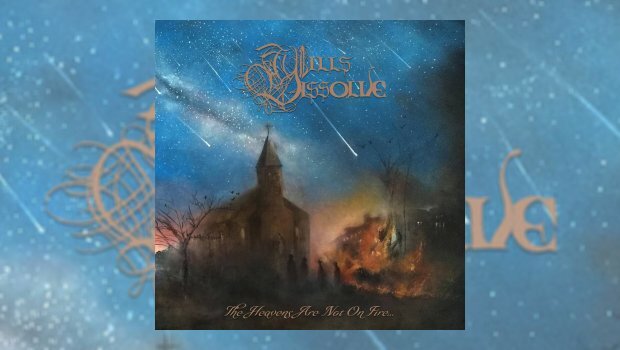 Texas-based progressive metal band Wills Dissolve’s debut album, The Heavens are Not on Fire, is an Opethian meditation on misanthropy and religion told through the lens of a rural West Texas religious community’s reaction to the Leonid meteor storm of November 1833. Guitarist Andrew Caruana described the overall theme as “the grave consequences of misapplied dogmatic zeal,” as realised in the story of that small religious community. Musically, the album feels like a soundtrack with its changing moods and the seamlessness of its transitions, a characteristic that is further emphasised by the way the song titles work together to form a single sentence. The album opener, and title track, is an eclectic blend of dark ambient, death metal, and metalised folk song. As with all the songs on the album, Wills Dissolve’s use of varying textures and soundscapes gives the nearly twelve-and-a-half-minute song motion and life that is sometimes lacking in songs of such extended lengths. The song has an arch-like structure that begins and ends with quiet ambience to bookend the chaotic metal riffing in between. The peak of the arch is a passage that features a melody akin to a sea shanty or other compound meter folk songs, sung using clean vocals. This eventually transitions through a whispered section back into the more chaotic sounds. The first song transitions seamlessly into So Do Not Mistake These Ashes, which opens with a syncopated riff that is completely blown away by the death metal riffs and growling of the verses. As with the previous song, there is a softer and cleaner interlude about halfway through that eventually yields again to brutal death metal. The opening riff returns in the end as a sort of coda to the song before transitioning to the next. Unlike the previous two songs, For Signs From on High opens heavy and does not deviate far from that sound throughout. There is a brief passage where the intensity diminishes, but the heaviness of the music remains along with the growled vocals. The song ends with the lines “no more certainty, no more humanity” before transitioning to an unaccompanied acoustic guitar for the last minute of the song and segueing into On This Cold November Night. The penultimate song on the album opens acoustically with clean vocals as the singer reflects on the events that have taken place. He describes walking around in a daze, his mind hazy and his soul filled with doubt. After a prolonged instrumental interlude, the growling vocals and blastbeats return to alternate with the cleaner sound for the remainder of the song, as if to illustrate the struggle to accept what he has witnessed. This song ends with solo piano over the sound effect of a crackling fire. The final, and shortest song on album, is the instrumental 11-13-1833. The song has a real “closing credits” feel to it, as if its purpose is to give the listeners an opportunity to ponder the story they just heard and consider its importance and implications. It seems odd to think of something described as a progressive combination of death, doom, and black metal as “an easy listen,” but it really is. The contrasts within songs and the seamless segues between them creates a musical work that really just slips by without any real effort from the listener. I wish my review copy included a lyric sheet so that I could comment more fully on the narrative and quality of the lyrics, but what I was able to decipher through listening sounded well-crafted. I cannot recommend this album highly enough.